The owners, Anne and Archie MacDonald, are particularly keen to welcome local families to The Orangery. The restaurant is perfect for dining that doesn’t break the bank. Ingredients will be sourced from the incredible local larder available in Highland Perthshire. Featured on the menu will be venison from the local estates, Perthshire lamb and Arbroath Smokies. “Sunday lunch will be ideal for families who are looking for a day trip destination. There are so many beautiful walks to start the day, as a result guests can work up an appetite before enjoying a slow roast rib of Scotch beef at The Orangery. The Sunday lunch menu will vary from week to week. There will always be a traditional Sunday roast cooked to perfection in the Aga”. The Orangery is filled with natural daylight and in the warmer months guests can enjoy drinks on the outdoor terrace. The décor has been completed in a boutique contemporary style. There is a blend of bespoke furniture and soft furnishings, along with an extensive eclectic art collection such as “Buttercup”, the Highland Cow, an original painting by renowned wildlife artist, Georgina McMaster. A country house boutique hotel in the heart of Highland Perthshire, The Old Manse of Blair combines traditional elegance with modern luxury. Large rooms and high ceilings reflect the character architecture of its Regency origins, while contemporary design ensues comfort and indulgence. Recently refurbished by new owners, the MacDonald’s, it is now a stylish boutique hotel and restaurant. 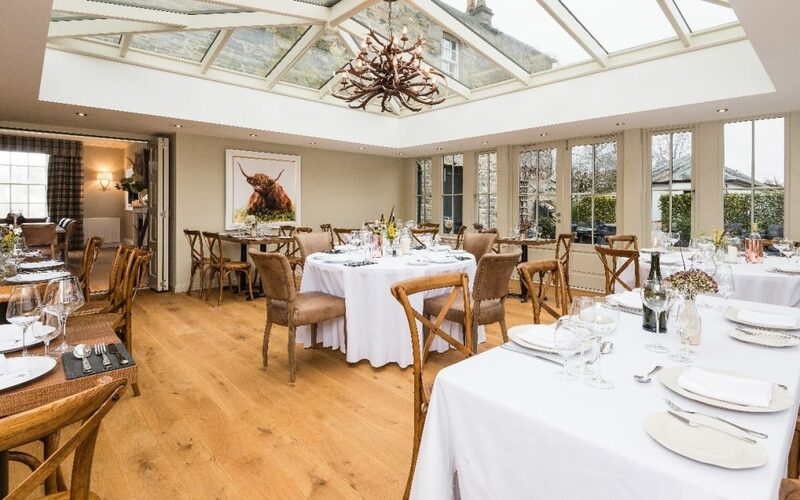 The Old Manse of Blair launches a new restaurant, The Orangery on 31 March 2019. The Orangery will be open for lunch, afternoon tea and dinner. The Orangery is under the leadership of consultant chef, Jonathan Greer, formerly of Ballathie House and The Gleneagles Hotel. Guests have the option to eat in The Orangery or to join Jonathan at the Chef’s Table in the Kitchen. Advance booking is recommended for both the restaurant and Chef’s Table experience. The Old Manse of Blair is located in the Cairngorm National Park, within the heart of Scotland. The Manse is located within a 30 minute drive of Perth and within minutes of the A9 junction at House of Bruar. The popular tourist town of Pitlochry is a 15 minute drive and many tourist attractions are easily reachable via road and rail. Edinburgh, Glasgow, Inverness, and Aberdeen are all reached within a 1.5hr drive with Fort William one hour with the road to the Isles and Skye beyond.